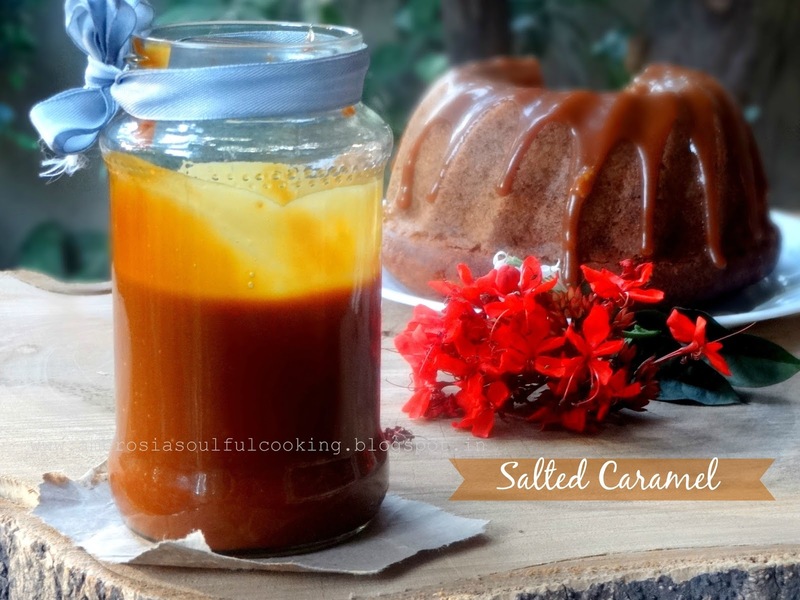 It is always great to have salted caramel sauce in your refrigerator. Sweet, sticky, buttery caramel sauce has a unique taste and flavour. Drizzle on ice creams, cupcakes, quick breads, cakes, cookies, sweet buns, scones or just dip your fruits in it. It can transform ordinary sweets into delish desserts. You will even love a spoonful right out of the jar. It is easy to make at home and can sit in the refrigerator for about three weeks. Take sugar in a thick bottom pan. Cook over medium heat. Keep stirring with a rubber spatula or a wooden spoon. Sugar will first become lumpy, but eventually melt and become amber coloured liquid. Keep stirring. 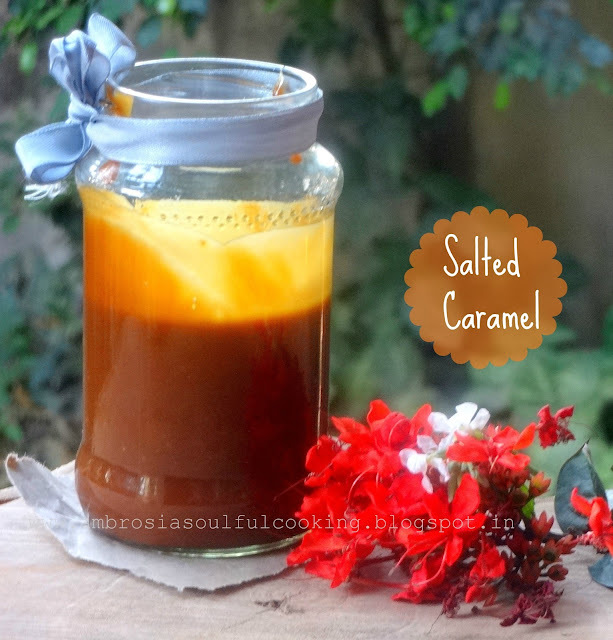 Once the sugar melts completely, becomes uniform in texture and turns golden, add butter and stir till butter melts completely (take care as the caramel is very hot and will bubble while adding butter). Add vanilla extract and salt and mix well. Add cream slowly, stirring continuously. Let the sauce boil for a minute. Turn off the heat. Let it cool. Store in a clean dry jar. You may refrigerate it for three weeks. Lovely, I am going to try it this weekend. Thanks Namita! Is the heavy cream Amul fresh cream, or whipping cream ? Hello Aditi, I used Amul cream and the results were yum. You may use heavy cream available in the stores. Hello Swati, 3/4 cup butter is about 75 gms. Hello Shruti, after you add cream, turn off the heat. Do not boil much. It does thicken on refrigeration. But otherwise, it should be of flowing consistency.